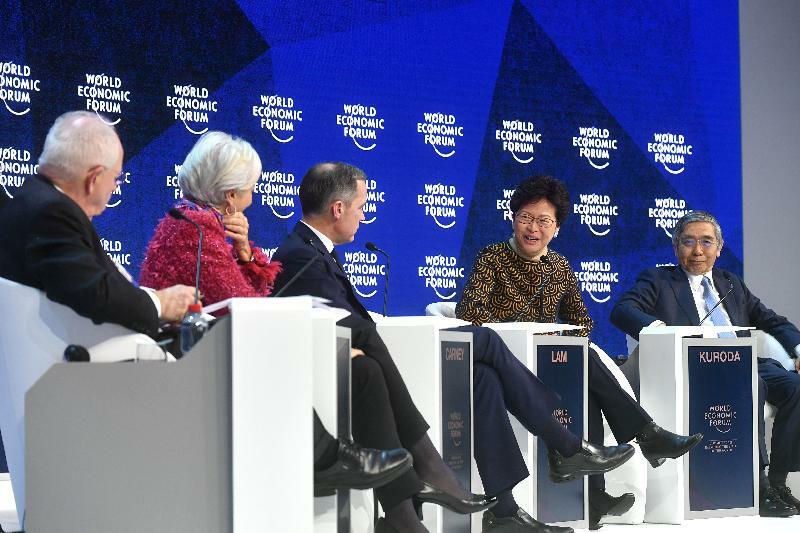 The Chief Executive, Mrs Carrie Lam, attended the World Economic Forum Annual Meeting (WEF) in Davos today (January 26, Davos time), which was the last day of her visit to Switzerland. 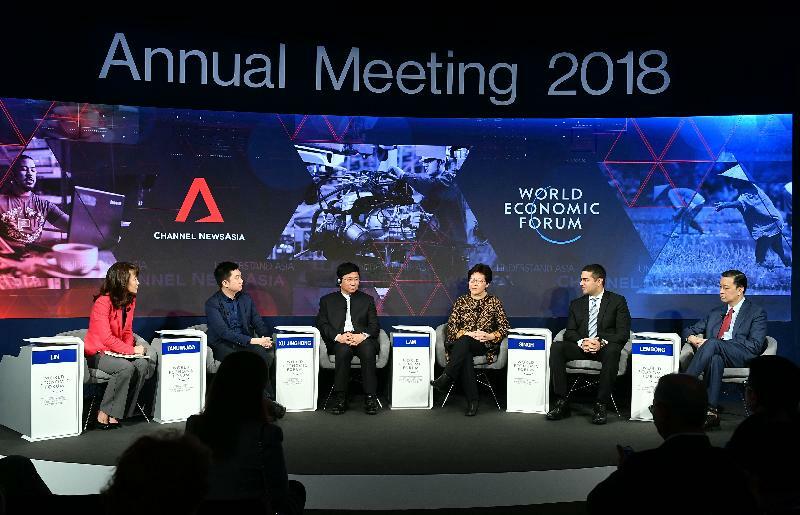 Addressing the WEF session on "Asia Works: The Fourth Industrial Revolution" this morning, Mrs Lam said Hong Kong is also embarking on the journey of its own fourth industrial revolution to diversify the economy and to boost further development in various areas through the application of innovation and technology, including Fintech, Biotech, Edutech, smart city and Gerontech. 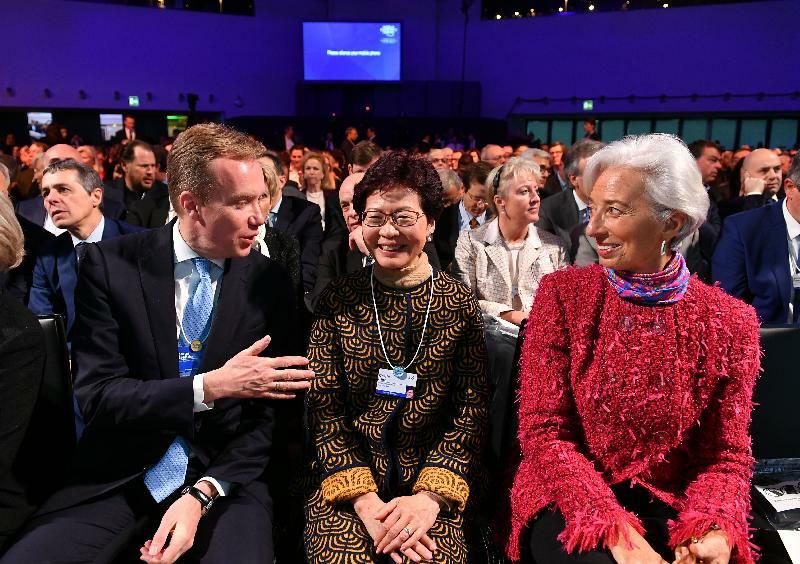 She said with the young people's enthusiasm in innovation and technology, the demand for quality service of the growing middle class population and, most important of all, its interconnectivity, she is very optimistic about the development of Asia in the fourth industrial revolution. Noting that Hong Kong has entered into a Free Trade Agreement and an Investment Promotion and Protection Agreement with the Association of Southeast Asian Nations (ASEAN) which firmly connect the city with the ten ASEAN nations, she said she believed the Belt and Road Initiative will further link up Asia and all other countries along the Belt and Road and enable them to complement each other to boost growth and exchanges. 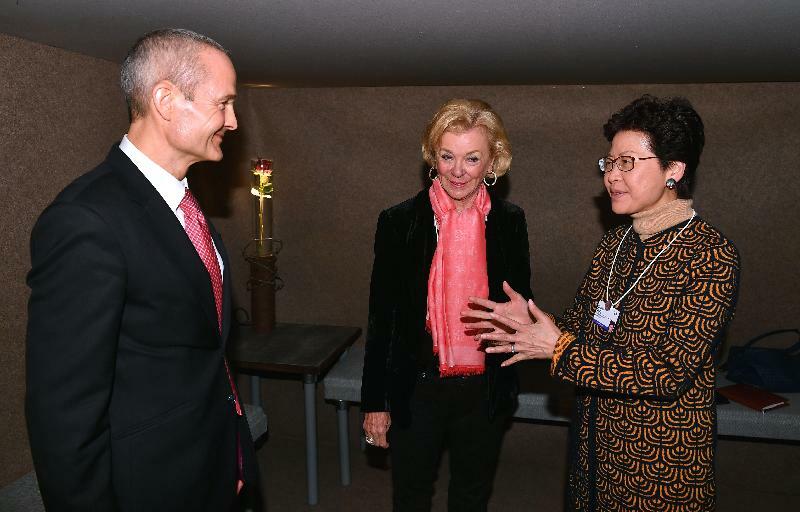 In a meeting with the Vice-Chairman of the Executive Board of Bertelsmann Foundation, Ms Liz Mohn, that followed, Mrs Lam welcomed the Foundation to set up businesses in Hong Kong and carry out other activities such as promotion of education. 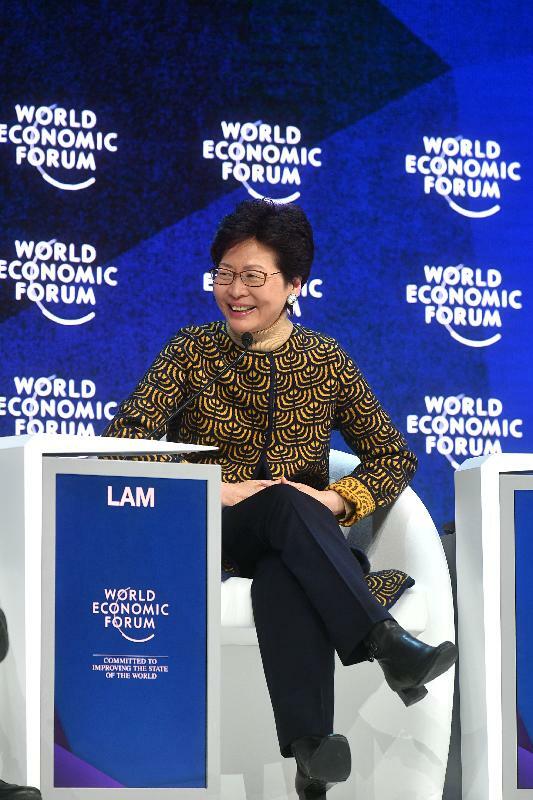 Expressing her appreciation for the efforts of the Foundation to advance exchanges in art and culture globally, she said the development of Hong Kong's art and culture is set to rise to a new level with the opening of the West Kowloon Cultural District. 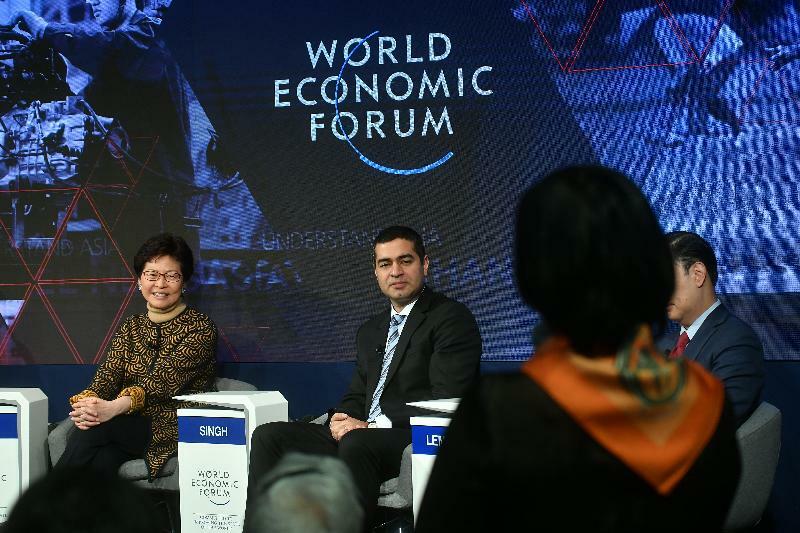 In the afternoon, Mrs Lam participated in another WEF session on "Global Economic Outlook". Other speakers of the session included the Managing Director of the International Monetary Fund, Ms Christine Lagarde; the Governor of the Bank of England, Mr Mark Carney; the Governor of the Bank of Japan, Mr Haruhiko Kuroda; the Chief Executive Officer, Asset and Wealth Management of JPMorgan Chase & Co., Mrs Mary Callahan Erdoes; and the Associate Director and Chief Economics Commentator of The Financial Times, Mr Martin Wolf. 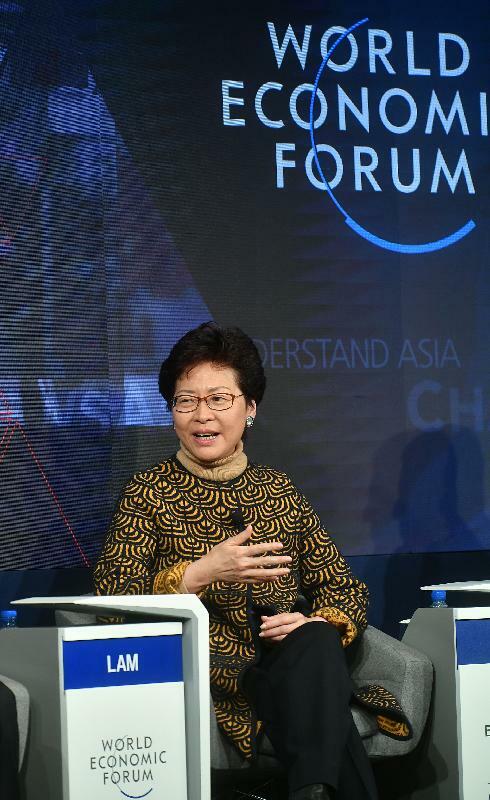 Noting that Hong Kong, a small and externally-oriented economy, is among the freest and most competitive economies in the world, she said in the session that the city has benefited from the world's economic recovery and will strengthen its economic foundation to seize the many opportunities arising from China's and Asia's economic development. She said that China's economic development has a big impact globally. President Xi Jinping said in his Report to the 19th Congress of the Communist Party of China last year that the Central Government supports Hong Kong in integrating its own development into the overall development of the country. 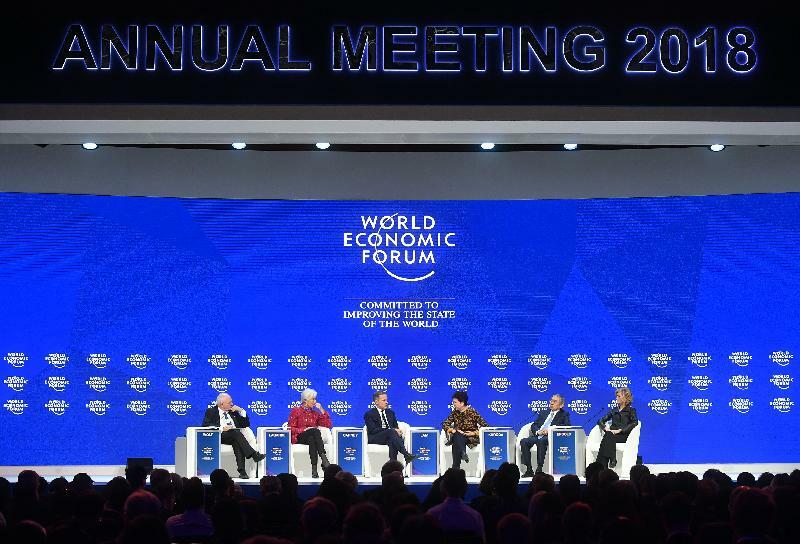 President Xi delivered two very important speeches internationally last year, including one in the WEF in Davos last year in which he said leaders in various economies should shoulder joint responsibility to propel the economic growth globally, and the other one was at the Asia-Pacific Economic Cooperation CEO Summit last November in which he appealed the economies to seize the opportunity of a global economy in transition to accelerate the growth of the Asia Pacific. She believed that China will continue to uphold free trade and economic globalisation, deliver the benefits of economic growth to all. 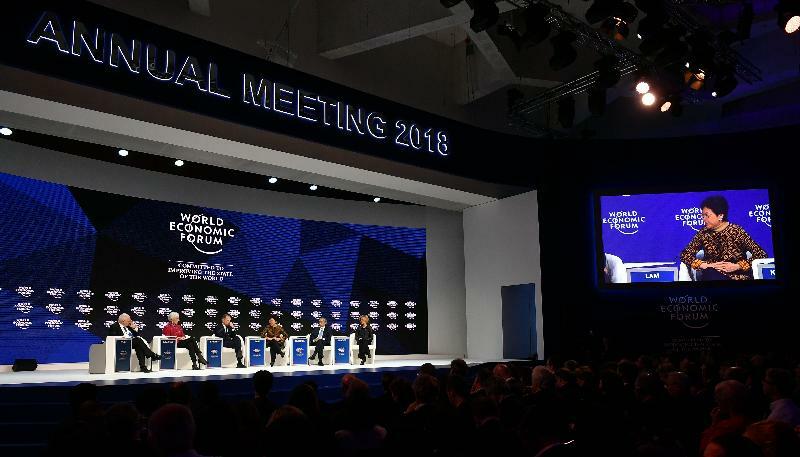 As the world is seeing some driving forces for growth, she said the opportunity should be taken to improve governance, focus on trade rules, strengthen regulatory collaboration and put in place sound social policies to address poverty, income disparity and the lack of opportunities for the young people. She said her government would embrace those values to put in place necessary social policies, making timely investment in education, enhancing connectivity with the rest of the world, in particular, with ASEAN, to boost social development in various areas. Mrs Lam also gave interviews to a Swiss media organisation and an international media organisation during the day. She left Davos after her activities in the afternoon and will return to Hong Kong in the afternoon today (January 27).